We billed the event as one that would showcase space expertise and capability from the real centre of Canada, as well as bring in folks from across Canada and worldwide. By our estimation: it was a success! We enjoyed the participation of over 100 space professionals, academics and students from across Canada and from other countries such as the United States, Australia and Azerbaijan. The multi-day event was a fantastic opportunity to discover the incredible footprint of space in and around Winnipeg, Manitoba. Leading us off was Magellan Aerospace, who not only stepped up as the Official Summit Sponsor, but who also provided a private tour of its space facilities, and had several staff give presentations including a keynote presentation by Mr Eric Choi, Senior Business Development Manager for their Space Business Unit. We had incredible volunteer support for the Public Event and the Summit Conference. This was followed by significant support from Manitoba Aerospace Inc as our Young Professionals Event (YPE) Sponsor, and the Manitoba Museum as our Public Event Sponsor, both of which allowed us to reach and connect to space professionals and enthusiasts in ways not seem before at other CSS Summits. The YPE was organized and coordinated by Khal Shariff, CEO of Project Whitecard and the Star Rangers Program. He gathered several enticing speakers such as Chris Hall from “The Portal”, Tom Tessier from Solara, and Dr Steven Freeland from the Western Sydney University of Australia. New for the Summit Public Event this year was the aspect of conducting it over 2 days at the Manitoba Museum versus our usually shorter, one event format. The Manitoba Museum was able to bring out many of its popular science and space activities while also permitting the CSS to conduct workshops in space art and rocketry, and to hold a space play called “Mars One”. Similarly, we were pleased to have the Sponsor Support from other organizations such as UND Space Studies, Inland AV, Precision ADM, MDA Systems Ltd, Analytical Graphics Inc, AppSpace Solutions Inc, EnviroTrec, and The Canadian Mint. Besides Mr Choi, the Summit enjoyed other keynotes such as Brigidier-General Blaise Frawley, Director General Space for DND, Ms Mary Preville, Director General Policy at the Canadian Space Agency, and Dr John Spray, Director of the Planetary and Space Science Centre at the University of New Brunswick. And finally, we were afforded the treat of hearing from Dr Steven Freeland as our Gala Dinner keynote. The Canadian Space Leaders Roundtable offers the chance for space groups to discuss important advocacy issues. 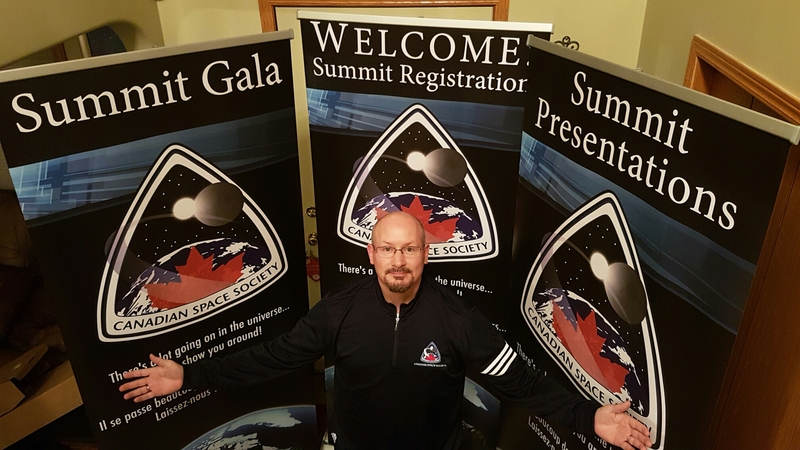 The Summit was also host to several important workshops: the Canadian Space Leaders Roundtable, Workshop #1 of the Fourth Canadian Satellite Design Challenge, and the “Getting Space Into The Classroom” workshop. Thanks goes out to Kate Howells, Larry Reeves, and Jeff Cieszecki respectively for their support in putting these ‘side-events’ together. A major thanks goes to our Winnipeg Summit 2016 Team! Next year Summit 2017 will be in Ottawa, 21-22 November.